COVINGTON, Ga. – A student-crafted poster based on a play about the Salem witch trials of the 1600′s has been removed from the walls of a Georgia high school after sparking national controversy. As previously reported, the poster featured a line from the 1953 play “The Crucible” by Arthur Miller, which declares, “God is dead!” It hung on display in a classroom at Alcovy High School in Covington, Georgia along with other student drawings. Although parents expressed disapproval of the artwork, district officials stated that the poster is rather a reflection of the drama as opposed to a statement about religion. However, some parents believed that the artwork should still be taken down due to its offensive nature. One of the most outspoken opponents of the drawing is parent Crystal Mitchell. She said that her daughter, who attends Alcovy High School, has been uncomfortable with the poster. Therefore, to combat the matter, Mitchell created a Facebook page entitled God is Alive in Newton. In just one week, the page received over 800 likes, and currently has over 1,800 likes. 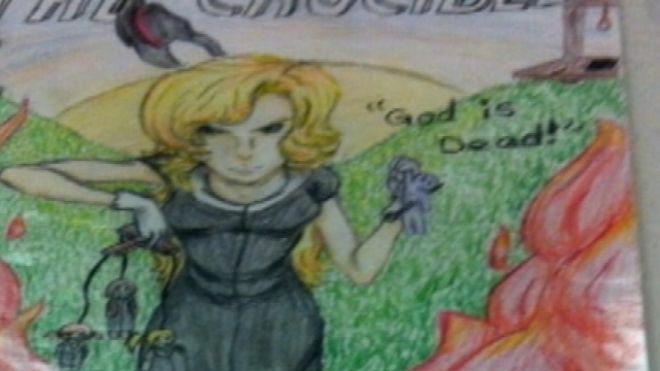 Mitchell met with school officials over her concerns, and was told that students would be advised of the context of the drawing, but that it would remain posted. However, this week, it was decided to take down the poster–at least for now. “The teacher made the decision to remove the art work until such time that she teaches the American literature course and ‘The Crucible’ as part of the associated curriculum,” a district spokesperson told MyFox Atlanta. The district said that the superintendent was also uncomfortable that the matter had drawn national attention. “She said it had just become too much of a distraction for her and for the school here and for the rest of the school system to tolerate,” Newton County Commissioner John Douglas told the publication.